The National Center for Families Learning (NCFL) is seeking educators to be nominated for the 2018 Toyota Family Teacher of the Year Award. This esteemed award recognizes the positive impact of teachers who engage families through exemplary practices in school and community-based educational programming. Click to review the selection criteria and to apply. 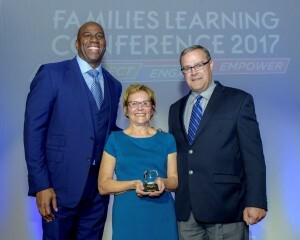 [caption id="attachment_10485" align="alignright" width="300"] 2017 Toyota Family Teacher of the Year Mary Andrews accepts the award from Earvin "Magic" Johnson, SodexoMAGIC and Mike Goss, general manager, Toyota Social Innovation[/caption] Along with recognition, this award comes with a $20,000 grant to implement innovative ideas for expanding the award recipient’s program to benefit families and/or to engage more families. One runner-up will be awarded $5,000. In addition, both winners will receive their awards September 24-26, 2018, in Ft. Lauderdale, Florida, at the 2018 Families Learning Conference. Both will receive a scholarship and travel stipend to participate. (Conference attendance is required to receive the awards.) Anyone with comprehensive knowledge about the nominee is eligible to complete the nomination form. Programs may nominate up to two family educators using separate nomination forms. Self-nominations will be disqualified. Incomplete nominations or late submissions will not be accepted. Please submit no later than 11:59 p.m. EDT on Friday. June 8, 2018. For assistance or questions, please contact Joshua Cramer at jcramer@familieslearning.org. To review the selection criteria and to apply, click here. Is this award active? Will NCFL be accepting nominations for 2019 or 2020?